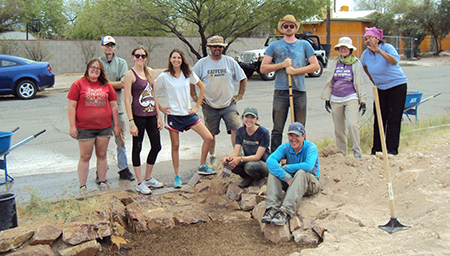 The Sept. 2015 insert features photos from 6 Tucson C2E project sites (a result of $60,000+ being awarded throughout the community), as well as how Tucsonans can support C2E by signing up for the Dashboard and donating. 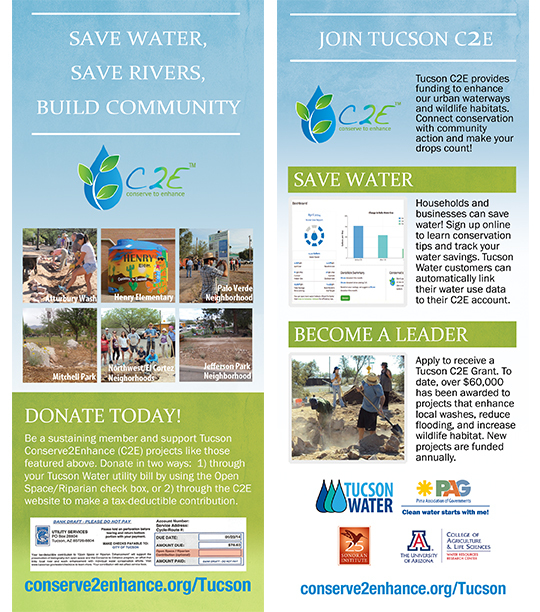 C2E connects your water conservation to community action. Learn how C2E can help you track water use and increase your water savings with our free, personalized C2E Water Use DashboardTM. There are active C2E programs throughout the Colorado River Basin. Click here to see if there is a C2E program in your community and to learn how you can join! Conserve2EnhanceTM (C2E) connects water conservation to community action. Using your C2E Water Use DashboardTM, you can track your water use over time, learn about where you have the most potential to save, and put your water savings to work supporting community-led enhancement projects! C2E links participant donations, based on their water savings, to funding for local environmental enhancement projects. By creating a C2E account on this webpage you gain access to the free C2E Water Use DashboardTM. This online tool allows you to enter water use data for your home or business, track your water use over time, learn where you have the most potential to save, and put your water savings to work to support enhancement projects! C2E is a versatile program that can be implemented in virtually any community. C2E can increase the performance of traditional water conservation programs and help utilities meet local restoration goals. Program development support and the tools on this website are provided for free by the University of Arizona Water Resources Research Center. 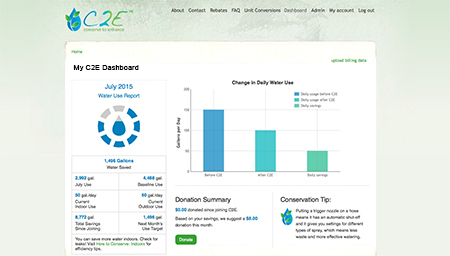 The C2E Water Use DashboardTM helps your community increase and track their water conservation efforts and a special administrative Dashboard allows you to customize messaging received by your C2E program participants.